WinTrillionas is an online lottery site that, among other banking options, accepts deposits in bitcoin. This makes WinTrillions a perfect place for bitcoin fans that enjoy playing some of the world’s most popular lotteries such as Powerball and Euromillions with bitcoins. The site has been around for 10 years now and it’s pretty active on the social media. The large number of regular customers and fans is enough to bring us to the conclusion that WinTrillions is a serious and trustworthy lottery operator. Certified by McAfee and verified by GoDaddy, WinTrillions is a perfectly safe site that offers more than 20 different lotteries, lottery syndicates and millionaire raffles. 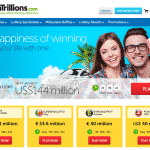 Users at WinTrillions can buy tickets for over 20 different lotteries worldwide. Some of the most popular lotteries among players at this site are Powerball, the Mega Millions lottery and Euromillions. The jackpot prizes of these lotteries are huge; some jackpots are fixed, others are progressive and some are announced right before the final draw. Unlike a typical Bitcoin lottery, this site offers customers to win millions of dollars from top lottery jackpots in the world. Those that want to play together with their friends and/or enhance their chances of winning by purchasing multiple tickets can join a lottery syndicate at WinTrillions. The entry price for these syndicates depends on the jackpot. For example, the Power Combo Syndicate share costs $11, while the Powerball Syndicate share costs $7. All prizes are equally distributed to Syndicate shareholders. Besides lotteries and syndicates, WinTrillions features a great selection of Millionaire Raffles as well. Players can easily search through the offered raffles and sort them by jackpot size or time left. Some attractive raffles that were actual at the time of the writing were Christman El Gordo (prize pool €2,240 million), New Year El Nino (prize pool €560 million and Club Mayor (prize pool MX$ 18 million). In order to be able to play players have to pay a subscription fee. Afterwards, the operator doesn’t charge any fees and it doesn’t keep a share from any possible winnings. The subscription fee is flat and there are no other hidden fees for using the site’s services. 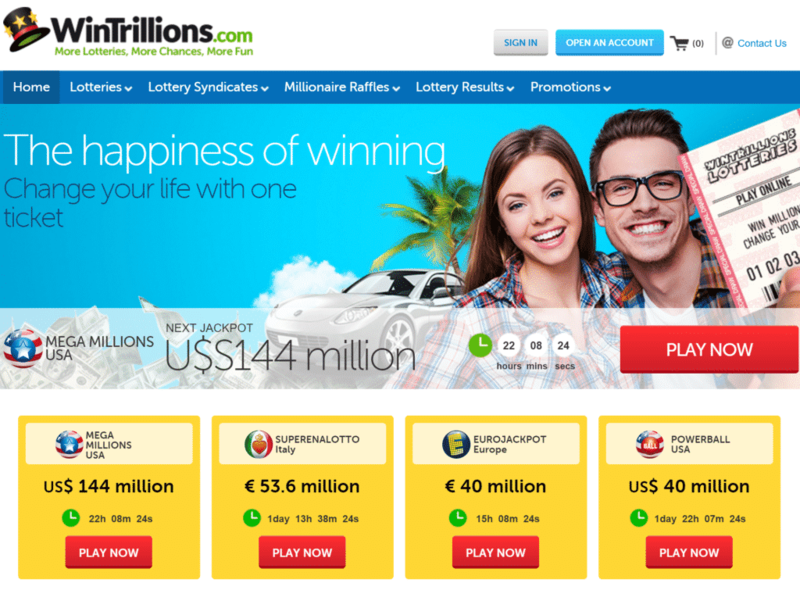 WinTrillions is not just a regular lottery site because it offers lots of promotions to customers that use its services. First on the list are the thrilling daily deals that last only for 24 hours and are excellent bankroll boosts. In addition to the daily deals, the site also offers gift vouchers that users can send to their friends and family in order to share the joy of playing lottery. Plus, referring your friends earns you free play for Mega Millions with Bitcoin or any other currency that is available such as credit cards, popular e-wallets and bank transfer. Finally, WinTrillions has a nice VIP scheme and the more a player plays, the more he or she wins. Buy tickets, collect VIP Loyalty Points and then use them to get tickets for free. WinTrillions provides a professional and highly responsive customer support team that works around the clock in order to solve customers’ issues as quickly as possible. Besides the live chat option, players at this site also can send an e-mail and/or use the provided contact form. However, it has to be pointed out that even though the WinTrillions offers a 24/7 support, the live chat support is not always online. If you’re a fan of guessing numbers and massive prize pools, you should consider joining WinTrillions. There are no reasons why you shouldn’t trust this operator that meets high safety standards and has produced numerous lucky winners. Additionally, this charming online lottery site gives you access to the world’s top lotteries and, at the same time, allows you to top up your account using bitcoin. Thus, we can say that WinTrillions is the perfect combination of a classic game and groundbreaking technology. You can buy lottery tickets online with bitcoin and have the same winning chances as those buying a ticket in a local shop. Plus, you can buy lottery tickets for lotteries that aren’t even available in your country. Finally Bitcoin enthusiasts can play hugely popular lotteries such as the Powerball with bitcoins. Join the biggest lottery jackpots in the world without leaving your home to purchase a ticket, or play on the go on your mobile device.